The chanting became louder. 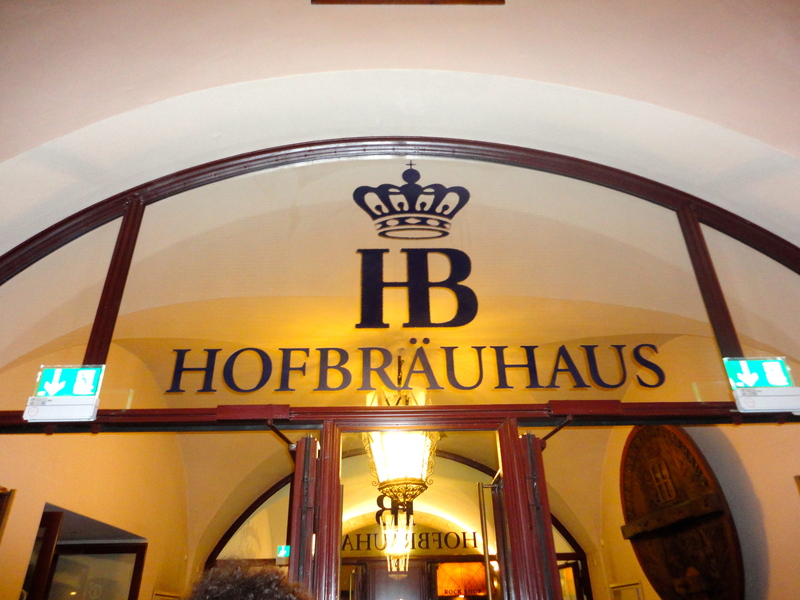 The Hofbrauhaus doors began to open. The crowd pushed forward. We grabbed and guarded the center table. The beers came out. 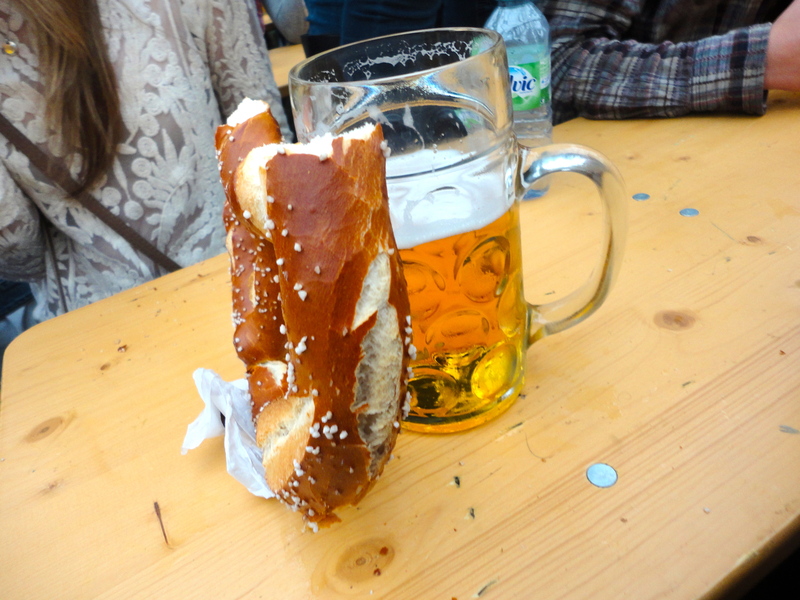 We yelled “Prost!” There was a giant pretzel in there somewhere. Things went black. Now parents, before you call to yell at me, THAT WAS A JOKE, relax. 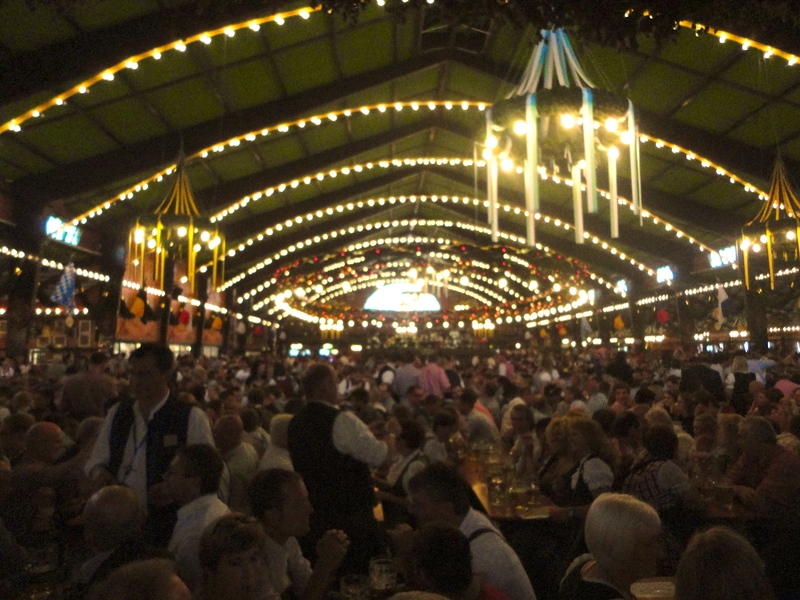 Right now, I am struggling to paint a picture of Oktoberfest. The best way to describe this magical land of beer is as a weekend of pure joy, singing, laughing, lederhosen, giant pretzels/hot dogs/chickens, and the best time you will ever have with both old and new friends. My friends and I arrived in Germany on Friday afternoon to the HolidayInn in Munich City Centre. 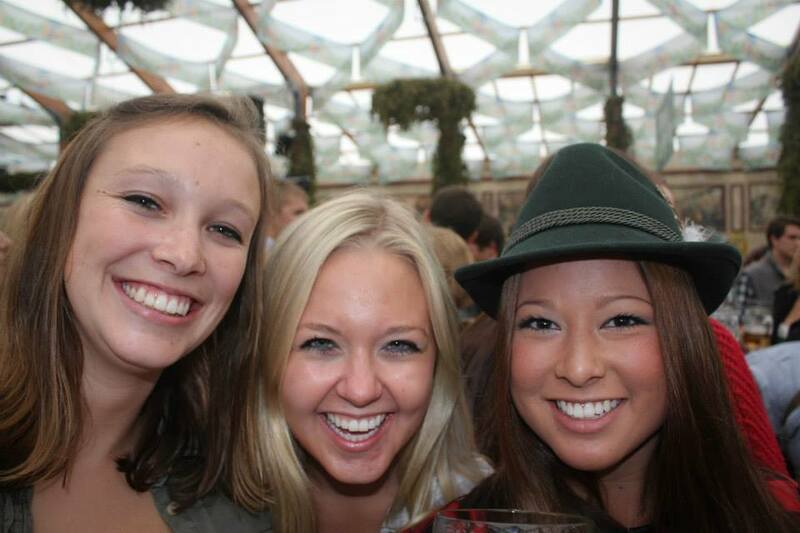 I am unsure as to how this tradition at Santa Clara began, but every year, “all” of the students from Santa Clara University who are studying abroad in Europe reunite the second weekend of Oktoberfest and stay at the HolidayInn. I’m not complaining though (insert remark about chilling at the HolidayInn here) it was a blast. I was feeling pretty homesick last week since everyone was back at school and I had officially been away from everything I’ve known for over a month. I can just see my Dad rolling his eyes at me as he reads about me complaining while I play in Europe, fine, I’ll stop! Anyways, it was great to see everyone. That first night I expected to do a little sight seeing, perhaps venture out to the castle, go around the historic parts of Munich, explore downtown and take in some German culture…nope. 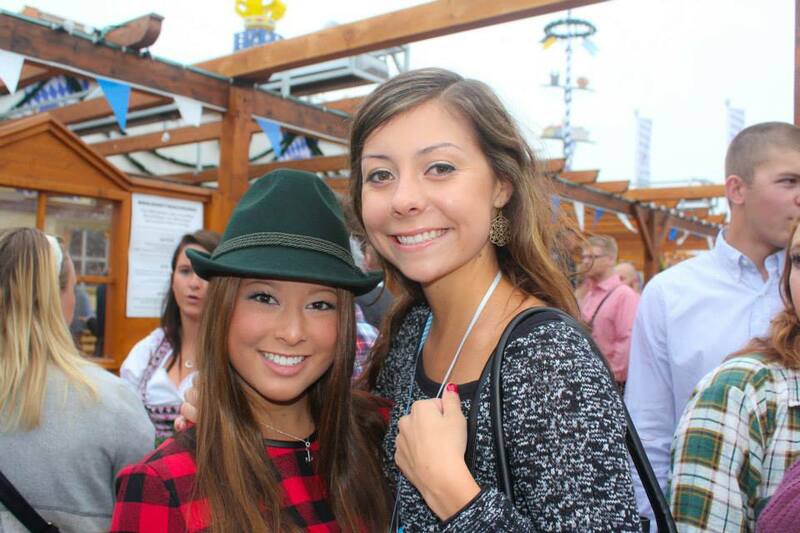 The crew came barging in dressed and ready to go to Hofbrauhaus, the very Americanized tent at Oktoberfest. So off we went! I am not sure what I expected, perhaps a glamorized circus or carnival with all of the tent talk, but I was once again very wrong. 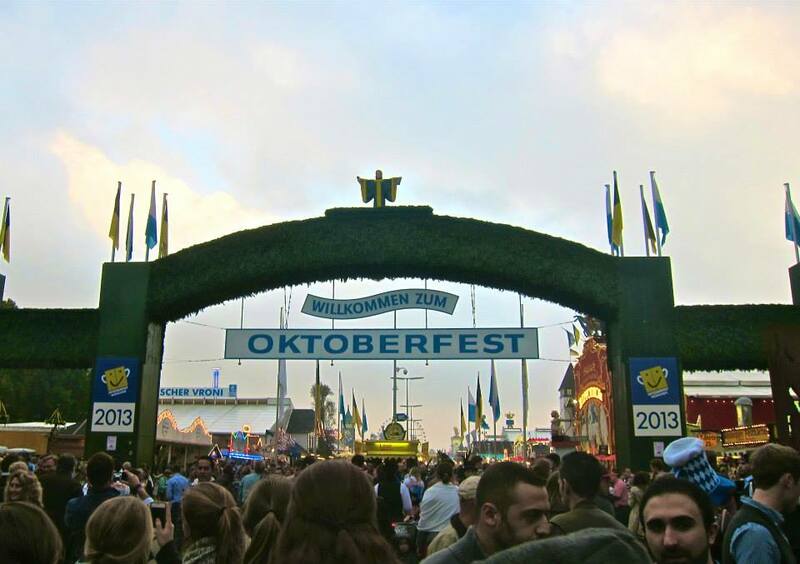 The famous Oktoberfest sign welcomed us with a warm glow at the front entrance and we walked into another world. 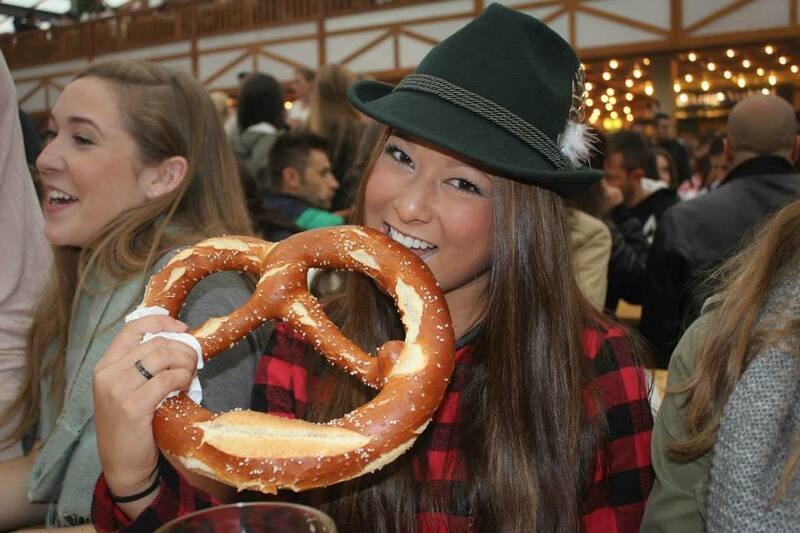 So this is Oktoberfest. 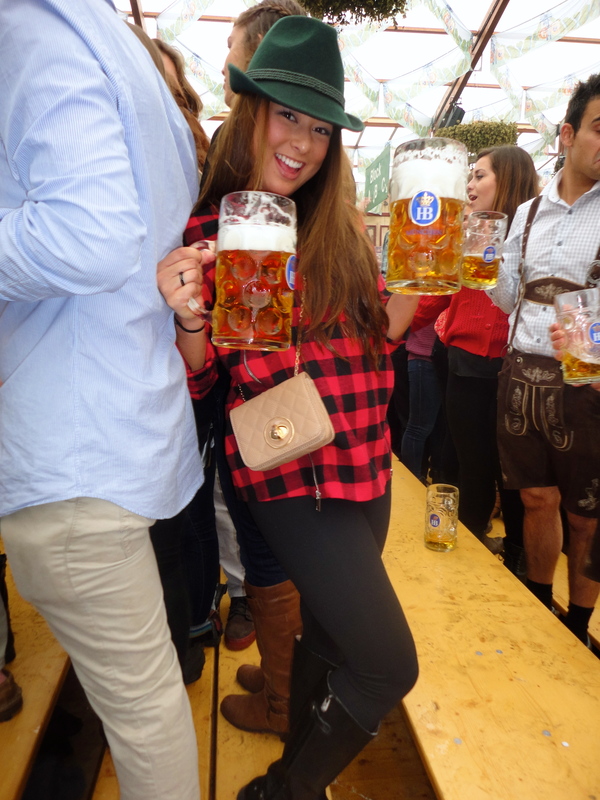 Everyone was dressed up in the classic lederhosen and dirndl attire. People were falling all over each other and laughing as they hit the floor. The rides were in full swing and the venders had everything a tourist could ask for. 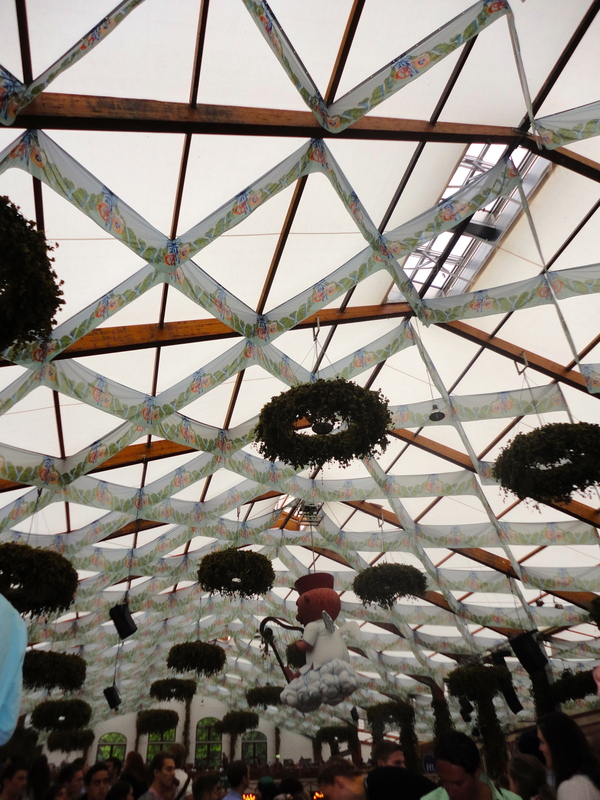 The biggest surprise for me was that the tents are not actually tents, but enormous, fully decorated buildings. As I took it all in with a very toothy grin, we found our friends waiting for us at the tent entrance. The security guards would not let us in for at least 30 minutes, but once we were in we found the SCU table and joined in on the festivities. 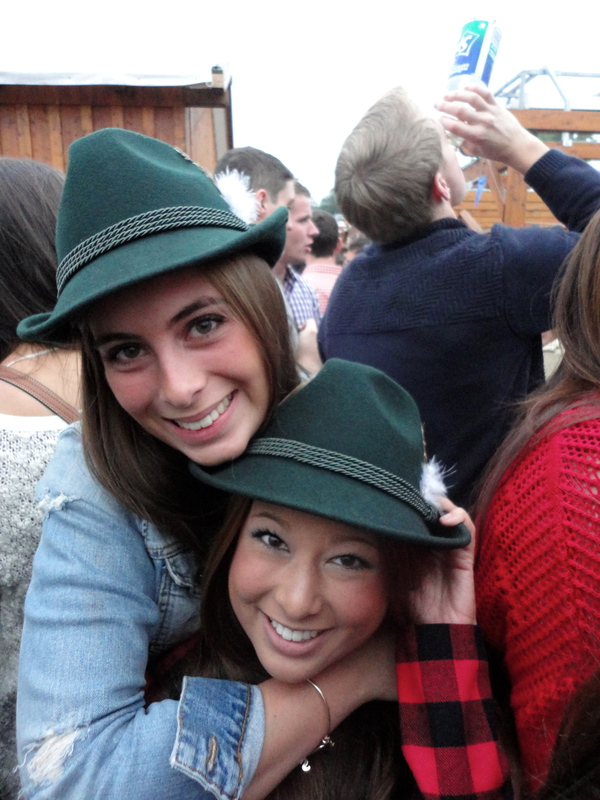 This was actually a great idea for me to go the night before and to experience what an Oktoberfest beer meant. They cost 9 euro which is actually 10 euro because the waitresses require a tip, especially from Americans. I justified buying this $13.58 beer for the following reasons: it was enormous, it is 13.5% alcohol, I was in Germany, and I stole the stein it came in. We did not stay too late since we had to be up by 5:30am the next morning. We took the train back and had a great night in our hotel extra plush beds. I have never been happier to wake up at 5:30am before in my life. We jumped out of bed, blasted some music, and pulled out our very festive outfits. After a very healthy gas station breakfast, we were on our way! The train took us directly from the front door of the hotel to the festival. We marched in as a pack and then it was time to wait, catch up with friends studying in different countries, and take our pictures before the beer filters. We must have arrived at just the right time, around 7:30am, because moments after we were followed by thousands of people. At 9:00am the doors opened and hell let loose. It was a ton of pushing, shoving, and screaming. Unfortunately, I suffer from short persons syndrome where one believes their 5’2 frame is actually 6’5. So I shoved back at the mostly Americans and some Europeans and quietly sent up a quick thanks that we were at the front and made sure I didn’t fall (anyone else remember how the parents in Superstar died? Picture that). Two other girls and myself rushed inside first and grabbed the table right in the center of the tent and stood guard on the seats with outstretched arms. Thirty second later, the Santa Clara crew saw and joined us. As we all jumped on the table, we broke out with cheers and screams of pure joy and excitement. The smiles were infectious. Quick side note, I do not suggest standing on the tables because the crazy waitresses will come up and pull out the table from under your feet and yell something scary in German at you if you don’t crack your head open, very safe. 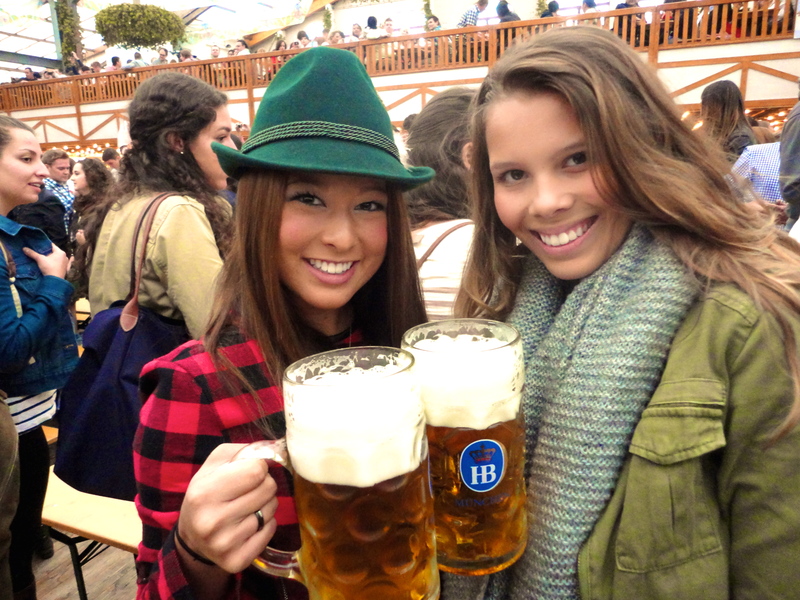 Despite what all the Oktoberfest blogs had warned, the beer came out almost immediately. We threw those 10 euros into the waitresses hands and swung our glasses into the air, “PROST!” Basically the rest of the day went on like this. 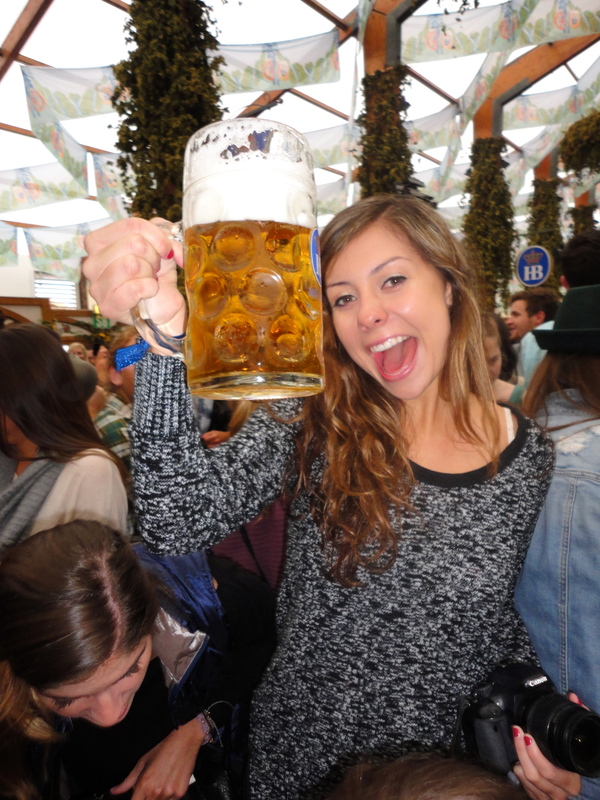 A day filled with more beer and more food than you can ever imagine. As I started on my third stein I quickly realized this is no Keystone, if one considers that beer, and became very thankful for the enormous pretzel I was working on. The day was everything I had expected and more. I even ran into 3 kids from my high school in New Jersey! It really is such a small world. 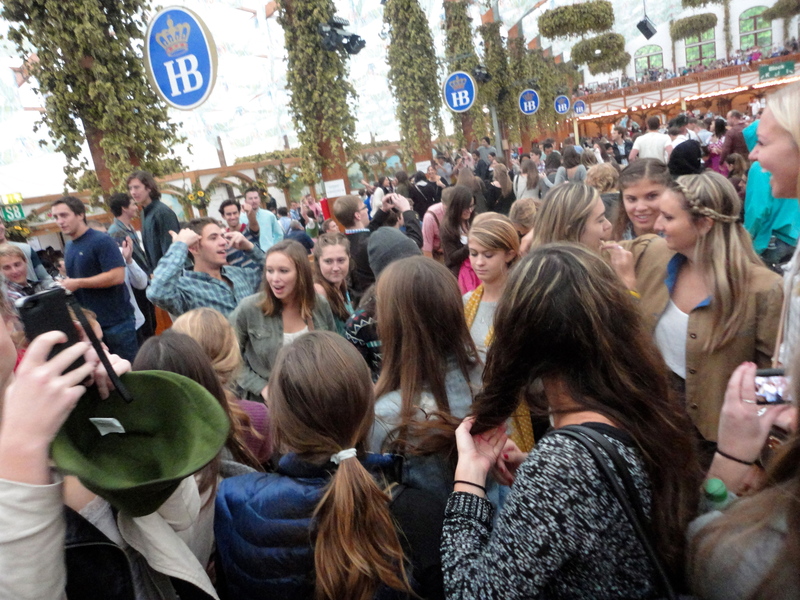 Somehow I ended up befriending a bunch of Germans with my friend and exploring a German tent with them. They taught us some songs and were thrilled to meet someone from California. I also think I was the first asian they’ve ever seen. “If you’re from America, why are you Asian?” “Omg, Rolf you can’t just ask someone why they’re Asian.” I had to quote MeanGirls eventually. 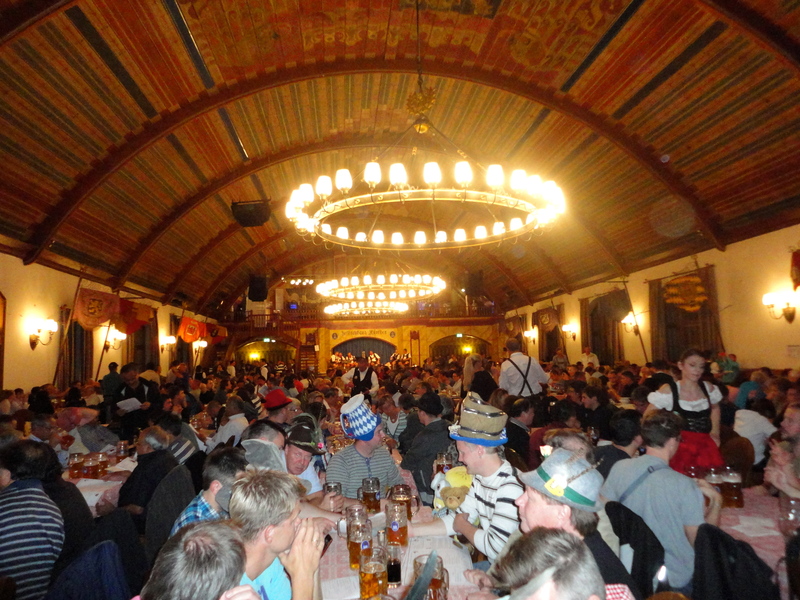 We ended up staying at their table for the next 4 hours and experiencing what I considered to be the real Oktoberfest in a tent filled with actual German’s and not American student’s chanting U.S.A! As the day drew to an end and my wallet was significantly emptier, I decided to call it quits. I jumped on the train and headed back to the hotel with a quick pit stop for some of the best mediocre Chinese food I’ve ever had. And then I passed out until my 7:30 am flight the next morning. 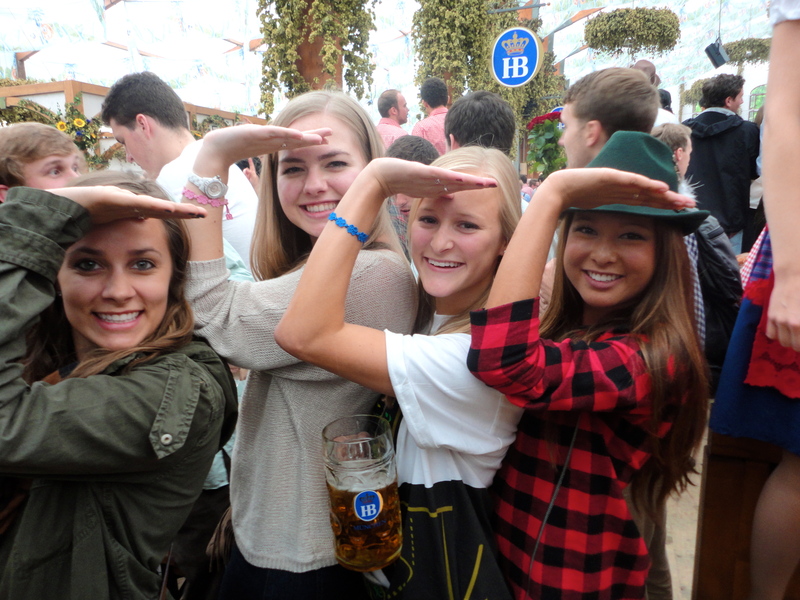 So in the end, Oktoberfest was incredible. 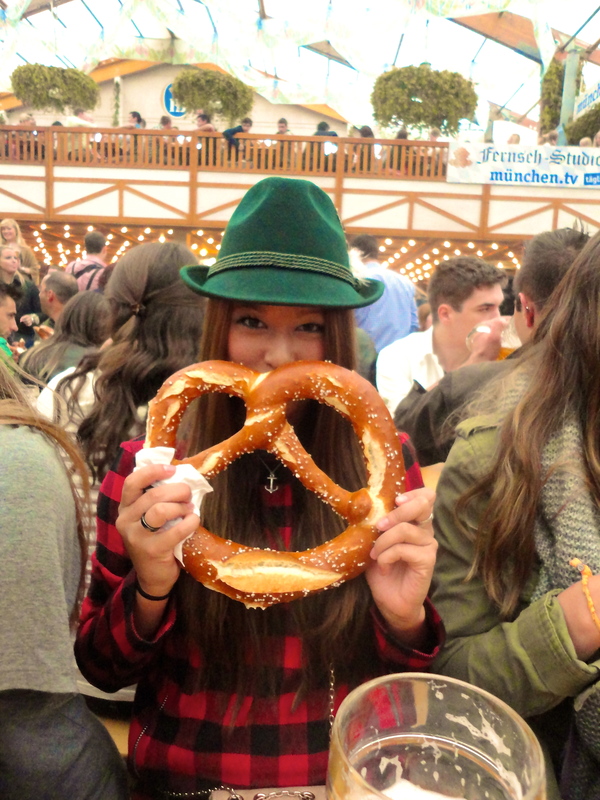 I am 100% going back one day and doing it all over again, but with a dirndl and a week long trip. 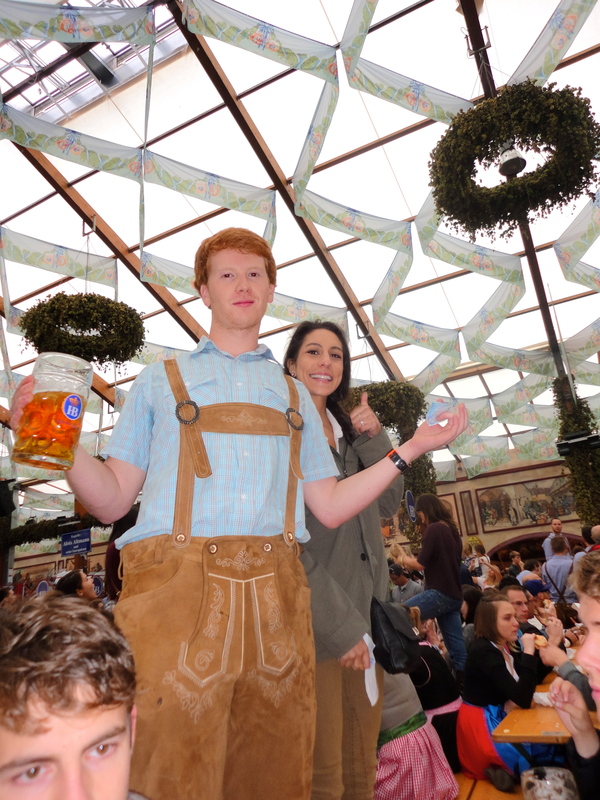 I may not have seen the castle or much of Munich, but I sure as hell felt German this weekend. P.S. 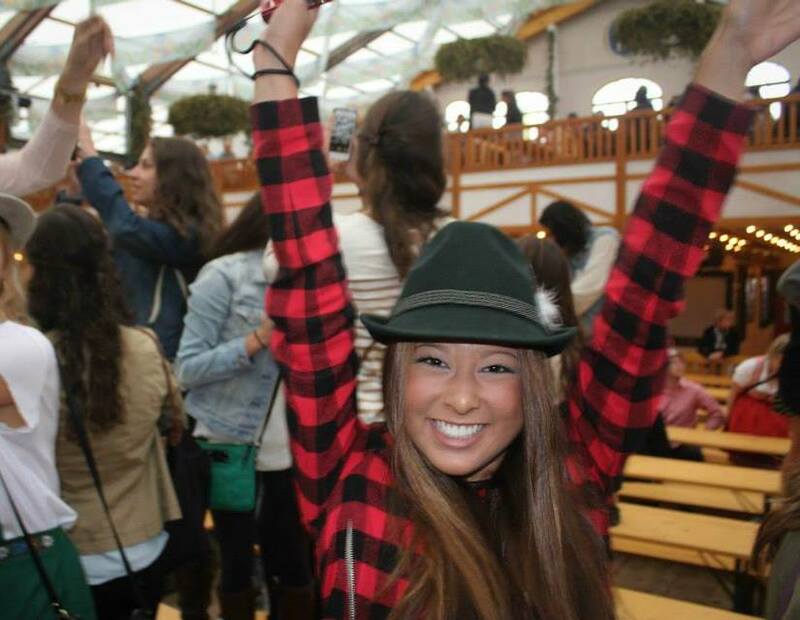 Oktoberfest, I love you.